Tis the season — restless and cold-weary — to dream up the summer’s homegrown delights. This year, consider adding a few nectar-rich items to your smorgasbord for neighborhood bees. Used by Native Americans to brew a tea; replaced black tea during the Boston Tea Party. Citrus-flavored leaves can be minced and added to fruit and used for jellies. Beautiful purplish bracts, 24-30″ tall, aromatic and colorful in fall. Excellent bee forage plant. Hardy perennial in zones 5-9. 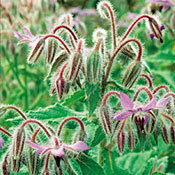 Can be used to strongly attract bees to your garden. “Bienen-freund” in German translates as “bee’s friend.” Subtle lavender-blue flowers with curved spikes that are absolutely covered by many different species of bees. Excellent results when used as an annual cover crop. Approximately 16,000 seeds per ounce. Annual, 12–24″ tall. Bushy, fuzzy-leafed plants produce edible 1 in. 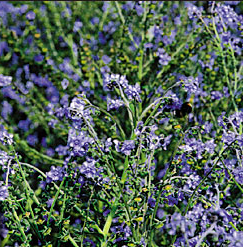 blue flowers that bees love. Tasty in tea and salads, the flowers also make pretty cake decorations. 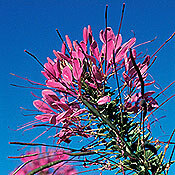 Bees and hummingbirds love this flower! 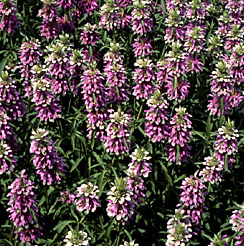 Multi- branched plant produces whorls of pale pink to purple flowers at the top of the stems. Flowers have long protruding stamens, giving a spidery appearance. What have you found attracts bees in the ‘hood? Soon, beekeepers in New York City may no longer be breaking the law. After months of prodding from rooftop beekeepers and proponents of community agriculture, the Department of Health on Thursday took the first step toward removing honey bees from a list of animals that residents are prohibited from raising within the five boroughs.